Take a walk through our Highmeadow model, a cottage home that’s perfect for today’s kick-off-your-shoes-and-enjoy-the-day lifestyle. 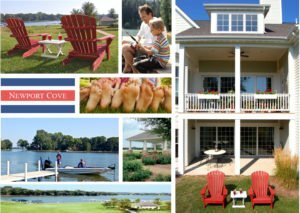 . . It’s one of the cottage-home models open for viewing at Newport Cove, a unique waterfront and boating community on the Chain O’ Lakes near Antioch, Illinois.